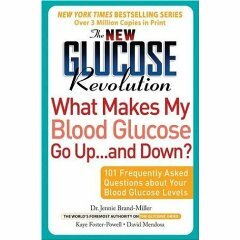 Yesterday, I spent a lot of time pouring through the book called “The Glucose Revolution”. Basically the book promotes taking food which is low in G.I or Glycemic index. Originally GI is developed as a tool for diabetics to control the blood sugar and insulin in their blood, its popularity spread through the entire world. How GI is derived: from how taking certain food affected the blood sugar level on real humans. Then, every 15 min, the volunteer’s blood sugar are tested to determine how much of blood sugar is in the system. The average is then taken as the GI. From there, G.I are developed for single as well as combined food. white rice, Jasmine rice, watermelon, dates, cornflakes, pretzels, sodas, bagels. table sugar (surprisingly), noodles, pasta, raisins, Mars bar (another surprise). Many types of beans & vegetable. The book also recommends that by careful food combination, you can take low and high GI food in single meal -if the overall GI factor is low, then your blood sugar will not flunctuate rapidly. continous craving for sugar and starchy food (not to be mistaken with hunger). You only specifically wants something starchy or sweet, even after a meal. always feel very bloated, sluggish, no energy, lethargic after a processed carbo meal. have the following signs: headaches, irritability, mood swings, dizziness, disorentation, lack of concentration, lack of motivation. avoid fruits in high GI such as watermelon. If you want to take food that is high in GI, then you must combine some low GI food to lower the effect on your blood sugar. Read more on the next topic: Are you a Carbohydrate Addict?